SUCO has developed training manuals for farmers adapted to the countries in which it works. Edition revised in 2015. In Spanish. Collection of 21 workbooks on agro-environmental techniques showing farmers how to integrate into their traditional practices (growing crops, raising animals and forestry) some new techniques that will improve production. The first edition of Machete Verde was officially launched in 1994 at the National Agrarian University (NAU) in Managua, Nicaragua. The document was produced under the umbrella of a project to develop the upper and middle reaches of the Malacatoya River (Boaco/Chontales) watershed in Nicaragua, where a number of NGOs were on the ground. SUCO promised to provide a forestry engineer and recruited Daniel Gagnon, who designed Machete Verde. This consists of a series of technical workbooks presenting methods that farmers can use to solve certain practical everyday problems and work more efficiently. Transfer of technical knowledge is adapted to the limits of users who read with difficulty or are illiterate. The manual is usually integrated into a training program led by specialists, but the tool itself is not at that high a level. If there is no trainer, farmers should be able to use it as a reference. 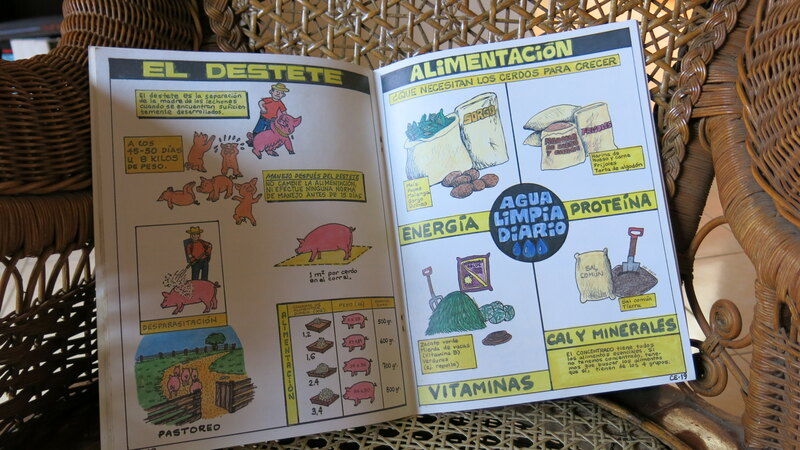 A set of agri-pastoral training tools designed for families in the Andes and created by the association Allpa in collaboration with SUCO in 2014. These are training and coaching technical documents that reinforce the efforts of agricultural and veterinary technicians to assist producers in the High Andes. La Yunta Andina is also a methodology whereby farm families and the general population can take ownership of the contents and help their community to flourish using a participative and organizational approach to development. Collection of 22 workbooks teaching agro-environmental techniques from Machete Verde, adapted to the Haitian environment in 2001. Guide around twenty pages long on nutrition, hygiene and local agriculture. The document is completely written and illustrated in Creole. Haitian women can use it as a system of reminders. This teaching tool was designed and produced completely in Haiti in 2015, for farm families in the commune of Marigot, jointly with 12 partner associations. We plan to produce new versions adapted for West Africa. Want a copy of these documents? Contact us at montreal@suco.org. We’ll be pleased to help!